HMS St Albans will act as the guard ship for the America’s Cup World Series event hosted in Portsmouth later this month. The frigate’s presence is just one of several ways in which the Navy has announced its support of the international race series, due to begin on July 23. 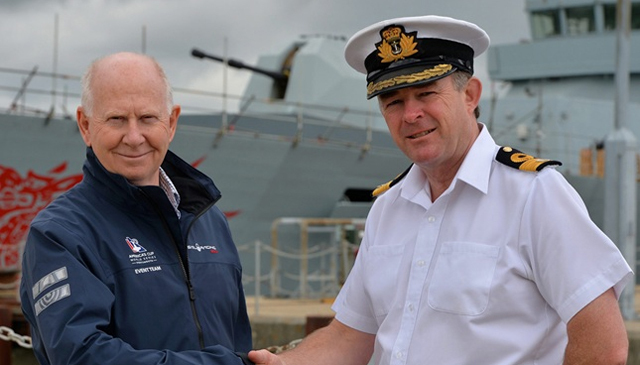 Commodore Jeremy Rigby, Commander of HM Naval Base Portsmouth, said: ‘As well as providing berthing and technical facilities on site, the Navy’s Queen’s Harbour Master has been instrumental in clearing a safe race course for the event. HMS St Albans will precede the Parade of Sail of the international racing yachts on First Thursday – June 23 – before the AC45 foiling catamarans began their four days of racing. They will also be flanked by the navy’s P2000 class vessels HMS Dasher and HMS Express who will assist with traffic management around the arena. Capable of speeds in excess of 40 knots, the catamarans with be visible from Southsea seafront for people hoping to watch the race unfold. Planning for the event has been extensive and has primarily focused on the safety of competitors, spectators and other water users. Clearly marked race marshals, safety craft, police boats and QHM craft will be on hand to safely shepherd non-participants away from the high speed yachts in the racing area. The Queen’s Harbourmaster is urging visitors to familiarise themselves with the marine traffic restrictions set in place for when the catamarans will be racing in and out of Portsmouth harbour. Details of anchoring restrictions and weather conditions will also be regularly updated on their website. Cdre Rigby added: ‘Audiences will see a frigate, patrol boats and landing craft, of their Royal Navy, flying the flag for the UK and helping deliver this spectacular experience. Nearly 164 years ago, from the Royal Yacht in the Solent, Queen Victoria watched as the New York Yacht Club’s sleek racing schooner America took first place in The Royal Yacht Squadron’s 100 Guinea Cup. The trophy was borne triumphantly to the United States and donated to the New York Yacht Club where it remained for well over 100 years before it was successfully challenged. The America’s Cup, re-named after the winning yacht America became a symbol of undisputed sailing excellence, and has since been competed for over ensuing decades. Sir Keith Mills, , founder and chair of event organisers Team Origin Events, said: ‘The support we have received from the Royal Navy has been fundamental to the successful hosting of the Louis Vuitton America’s Cup World Series in Portsmouth. The Navy’s involvement also includes evening entertainment with The Massed Bands of Her Majesty’s Royal Marines at the South Coast Proms on Thursday 23 and Friday July 24 in the Waterfront Festival Arena on Southsea Common. The band will perform a two hour concert each night performing a selection of classical, contemporary, military and mainstream music. Further FREE Waterfront Festival Arena ‘day’ tickets have been made available for the America’s Cup World Series, Portsmouth. The Waterfront Festival Arena capacity has been increased to satisfy demand and allow additional free ‘day’ tickets on Saturday 25 and Sunday 26 July. Singer-songwriter Rebecca Ferguson and Isaac Waddington, the 15-year-old finalist of this year’s Britain’s Got Talent to play on Sunday afternoon at the official prize giving in the free-ticketed Waterfront Festival Arena.